Why expend energy on carrying or pulling a bag of clubs, when the playing is the most important part? Golf may not be the most aerobic sport in the world, but given that you’re out there for the best part of 5 hours, it’s surely one of the more draining games out there. As such, any previous stigmas and parallels about electric push carts or trolleys being commensurate with age are fast disappearing, and popularity is growing as they appeal to a wider market. But, what to look out for when making your purchase? All sorts, really. What material are they made of? How much do they weigh? How easy does it assemble, and can it be stored easily? Does it sit comfortably as you walk? What’s the battery that it comes with like, and does it have decent power? And are there any other cool features which add to it? And is the price fair? It’s a lot to contemplate. But then again, contemplation is kind of our thing. 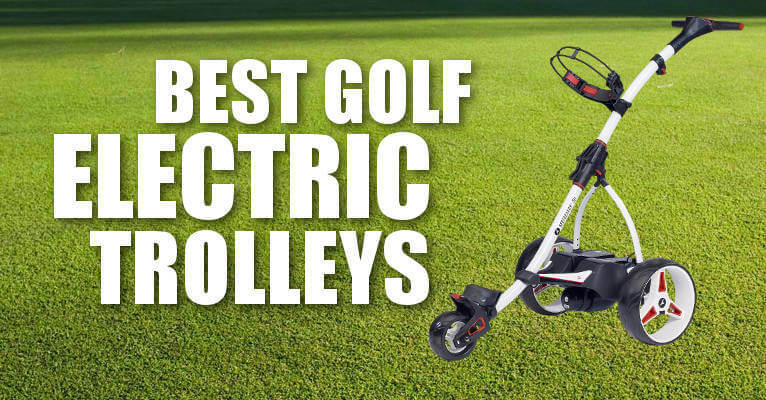 So read on to find out which electric trolleys we felt stood out from the crowd. An upgrade on the ‘Coaster’, Bag Boy have delivered the ultimate in digital electronics here, with a robust and very impressive model. If you are in the market for something a little more high-end, the Navigator puts forward a strong argument. For starters, the Gyro Anti-Deviation technology does a superb job of keeping the motion of the ocean on the beeline that you command it to. But of course, it is at a digital level where it truly excels. Full color, a multitude of speed settings, a neat battery indicator, full swivel and directional propagation and a host of other intelligent features. Added to that, this comes with other awesome extras like a fifth wheel (retractable, and provides extra stability), twin 230W motors, front swivel wheels, holders for drinks/umbrella/cell phone and even a dual gearbox system. Oh, and it all folds up beautifully in two simple steps. What more can you say? The grand-daddy of features. It’s more intelligent than me, that’s for sure! Costs an arm and a leg. But it’s a peach! Okay, so we’ve started with one of the pricier models first up. But hear us out – because the initial shock could well make way for a desire to dip into the pockets for this one. In short, the Stewart X9 simply oozes class from start to finish. You simply pop it open with one simple movement, take off the cover and connect the battery. It’s been on the market for a couple of years now, but this remains a leader in the use of Bluetooth technology. The handset and trolley are automatically paired, so all you have to do is switch it on, wait a few seconds and then hit follow on the handset. It stays synced for the entire round too – no interruptions. 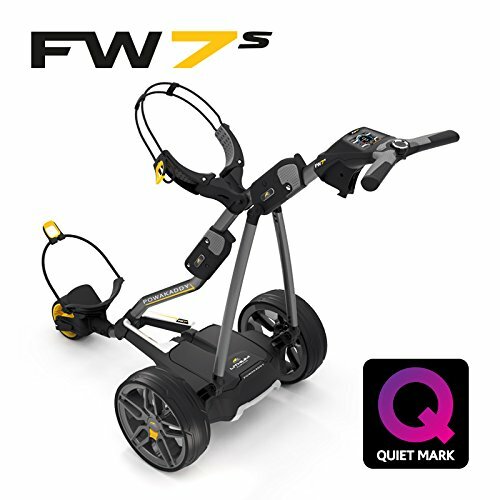 You can place the handset on the trolley, and steer it in car parks or elsewhere that needs maneuvering, but, for the rest of the time, you can simply have a leisurely stroll around the course and, between shots, forget your clubs are even there. This thing just follows you like a faithful dog. Features include a downhill brake, stabilizer, complete remote functionality (handset is rechargeable too) and a top-of-the-range V3 wheel set. It has excellent control and balance, even across side slopes and bumpy terrain. And it’s quiet too. Honestly, it brings a whole new level of relaxation to a game of golf, and we think this one truly is hard to beat in terms of sheer quality. 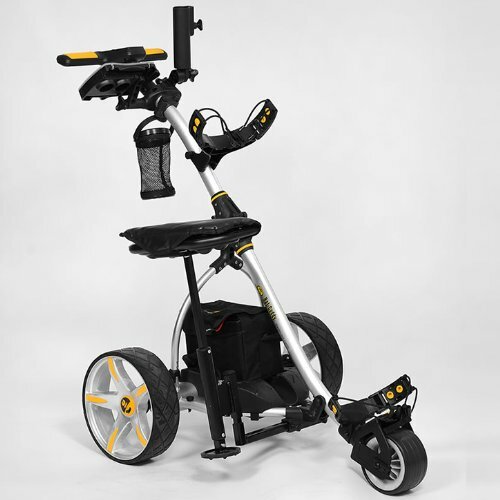 Powakaddy are veterans of the electric trolley game, and have numerous models within the FW range. But the FW7s is particularly interesting given that it came not long after the FW7. So what’s the difference between the two and why the marked increase in price, I hear you ask? Well, it’s still unquestionably combined all the good qualities of the FW7 and other Powakaddy predecessors. The cart itself is as light as a feather, it folds up almost into your back pocket, is easy to assemble, and, well, it looks pretty bling too! But there’s more that’s been brought to the table here. You have a choice of three types of battery for one thing, although the lithium option is a no-brainer for us – it weighs less than a quarter of its lead counterpart, and has around 20% more to give in terms of staying power. Added to that, the motor has an extra 30W of oomph, the display is around 50% bigger (and thus much easier to operate), the Automatic Distance Function (ADF) has 10 settings (and can go up to 50 yards) and you have the option of the new Electronic Braking System (EBS). Oh, and the 11-inch titanium rims tower above any other Powakaddy trolley’s wheels. All in all, a significant upgrade which should definitely pique your interest. It’s fair to say that remote-controlled options for electric golf trolleys haven’t necessarily been a favorite among brands, other than perhaps Stewart, who are synonymous with them. But Motocaddy took an interesting turn last year by introducing the remote-controlled S7, and it’s fair to say they’ve done a good job of it. No doubt, it’s a bulky frame, the lithium battery isn’t the lightest out there, and at nearly 30 lbs, it weighs a bit. But the Quikfold design is true to the name, and it collapses (and assembles) very easily and conveniently. This thing screams power and stability too, and the wheels feel glued to the ground, even on the niggliest of side slopes. The trim and tilt functions do a good job as well. 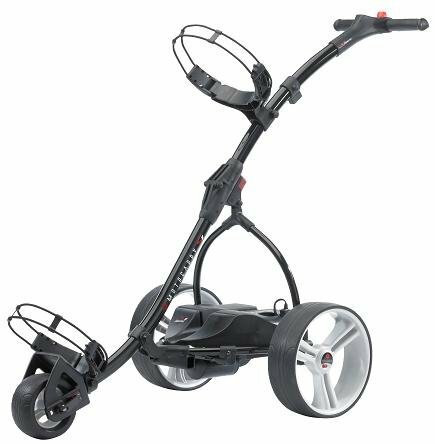 It has a great set of features too, including downhill control, Easilock (to hold the base of your bag in place), a pause & resume function and an utterly seamless transition between remote and manual control – should you need it. But above all, you pick up that remote, and you feel like a kid again. It’s a lot of fun, and it feels like a personal caddy. And, unlike your golf ball, it does everything you want it to and more! Battery disconnected when travelling over two different bumps – a regular issue perhaps? This is one of those which typifies the issue of price in this particular niche. Is the Bat-Caddy X3R the most high-quality piece of machinery in the business? Of course not. But is it good value for money, and an attractive option for golfers of all shapes, sizes and abilities? We think so. The remote is as powerful as any (allegedly up to 120 yards, although we recommend keeping it within 20 or less). It performs as well as any of them on hills and slopes, it’s sturdy, is very easy to fold up (and assemble), operates like a dream, and handles very well when doing so manually. Yes, it’s a heavy-duty performer at a whopping 64 pounds (lift from the knees! ), and probably won’t win any beauty contests. But it does exactly what it says on the tin, and should happily last you a very long time. All three of our key considerations are vital, but this is probably the most important of the lot. 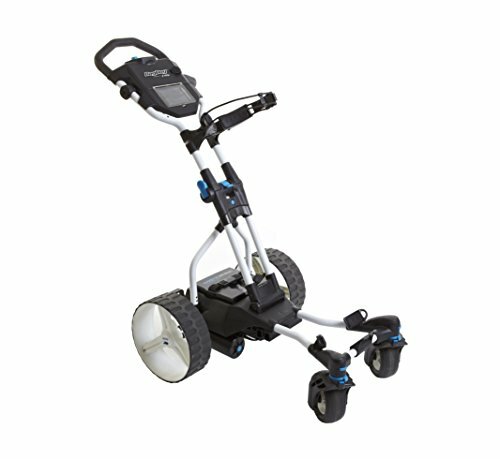 Durability is at the core of what you want in an electric golf trolley, but so is having a streamlined design, which doesn’t weigh a ton. Striking the balance between something sleek, slender and lightweight, while still packing a mean (and enduring punch) certainly isn’t a given. Materials are quite significant in this respect, with aluminum, titanium and steel being the regulars. The former is obviously great in terms of weight (or lack thereof), but they do tend to be prone to dents, while steel is almost always the stronger but heavier alternative. For this reason, we tend to favor titanium when it comes to build quality. But that’s by no means a hard-and-fast rule! Lastly, you’ll definitely want something which you can disassemble quickly, and fold up such that you can store it easily. That’s just a pre-requisite these days. Ease of use starts from the very beginning. How easy is the trolley to assemble? Do all the parts fit in nicely? Is the battery simple to set up? Then of course you want it to be easy to operate during the round. With some, it may be a case of turning it on and off, with only a single speed on offer. Others may have multiple speeds, while brakes have even become commonplace to prevent the trolley getting away from you when descending hills and slopes. Some even have remote controls so that you can send it wherever you want! 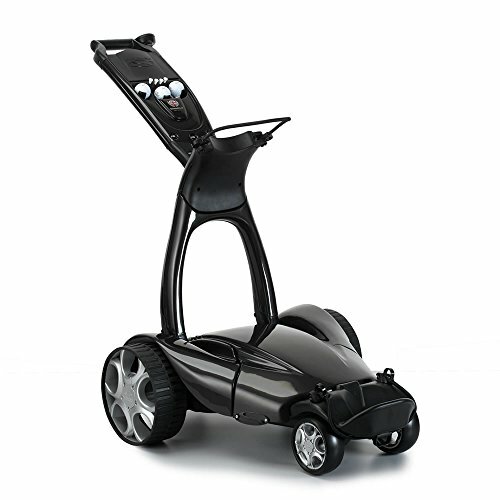 Whatever functions and features the trolley has, the key is for them to simple and easy to operate, so that you can save your concentration for the golf – and, by extension, taking money off your mates. So, this one can be a little bit difficult to call, purely because of the enormous fluctuations in price in this niche. What is your budget here? You can spend anything from a couple-hundred dollars to a couple thousand. Obviously you’re going to get what you pay for, but, really, it all comes down to what you want. We’re sticklers when it comes to the difference between value for money and cheap, but hey… if you only play once or twice a month, and/or the course(s) you generally venture round on are pretty flat, then cheap and cheerful might be just what you need. It’s something to think about when reading the below, but we’ve tried to cover all the bases and price ranges. One thing’s for sure, if we say the level of quality outstrips the cost, you can trust us.